A total of 50 women from the Women Self Help Groups of Tiruvallur District and Kancheepuram Districts were the benefi ciaries identified for adopting this technology. 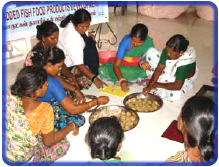 Based on the training imparted by the institute, value added fish food products like fish cutlets, fish pickle, shrimp pickle and fish were developed by these benefi ciaries in a hygienic manner and packed in attractive covers developed by this institute.Market linkages were identified for these products through various interactions.The potential of this intervention to generate additional income is evident from the analysis of net returns for the three items developed and marketed by them: fish pickle-Rs. 240 (batch of 12 bottles ); shrimp pickle -Rs. 300 (batch of 12 bottles); and fish samosa-Rs 137.50 (batch of 55 nos. ).